Okay... You, Roger Klause, Bill Malone, Ed Marlo, Bro John... I feel that I should know at least two more, but I am blanking on names. Plus Don England and David Neighbors? David Neighbors! Yes, good job, Chris. That's one of the two I knew I knew, you know? Almost there. Now I cannot rest until I know who the other guys are. Anyone? The missing folks will be difficult to ID. Good job on the others! 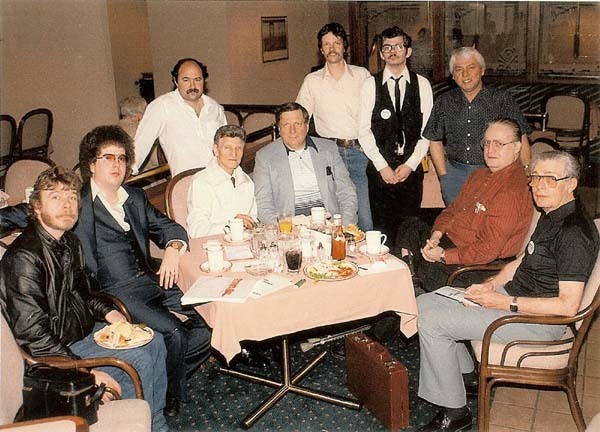 Is that Tom Mullica in the waist-coat standing next to Roger Klaus? Or is thst David Neighbors? Who are we missing? The to 2 either side of Marlo? Is that Tom Mullica in the waist-coat standing next to Roger Klaus? Who are we missing? The to 2 either side of Marlo? Waistcoat? That's David Neighbors. We're missing the person to the left of Bro John, and the persons to the left of and behind Marlo. Just out of curiosity, what year was this photo taken? I'm still puzzling over this bunch. I think this was taken at the Marlo 35 Years Later lecture. That would be 1986. Yeah, I'd say we did pretty good!!! Thanks for sharing the photo. Nice piece of history. I was fortunate to see Marlo one time in the 80s, and to be honest I had no idea who he was at the time. I sat in on his lecture thinking, this will be okay until the next big name lectures. Wow. Talk about blown away. Glad I had the chance. It must have been cool to hang out with so many of the "names." Guy behind Marlo looked to me like Jason Alexander with a mustache. Hey, he is a magician after all! If you have any other pictures to share I would love to see them. The guy behind Marlo is Kevin Kelly, a good friend of the late Don England. I thought he looked like David Crosby of CSN.